Posted on Monday, June 19th, 2017 at 12:53 pm. Wednesday marks the official day of summer. I know, between the weather and the kids finishing up school it already feels like summer, but Wednesday makes it official. Summer highlights some of my favorite things: getting outside, spending time with friends, sipping wine while watching the sun set. I’m kicking off the first official day of summer at the San Francisco Premium Outlets. 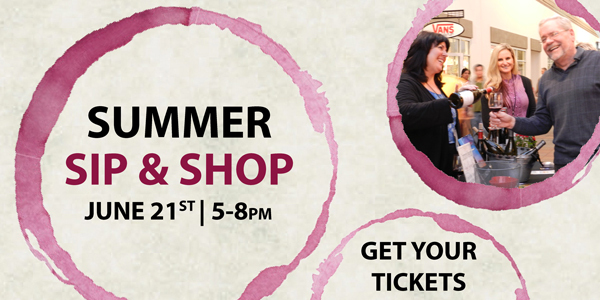 From 5-8pm you can sip wine and shop with increased discounts for those participating in Summer Sip & Shop. What is Summer Sip & Shop? It’s a new event this year, there will be more than 10 wineries pouring their favorite wines throughout the outlets. Retailers will have additional discounts for those participating in the event. Is there a ticket? Yes, tickets purchased in advance are $20, day of $25. With your ticket you receive 15 1-oz tastes, a Govino wine glass and, as I already mentioned, discounts at MANY of the retailers. See the full list of participating wineries and stores below. Basically, there is no better way to kick off the summer. Get your tickets today!